Houthi authorities in the Yemeni capital of Sana'a declared on Sunday state of emergency to tackle cholera, as the epidemic-associated cases and deaths have seen sharp increase in the past three months. 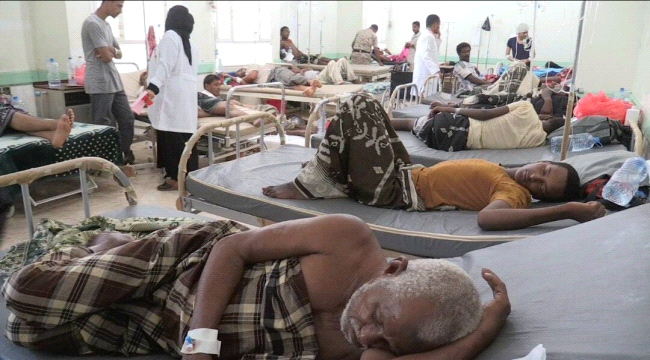 327 people have died, out of the 162,463 cholera-infected cases, throughout the first three months of this year 2019, said the Houthi-appointed health minister Taha al-Mutawakil. WHO recent data have also revealed an increase in deaths following cholera in Yemen to 291 cases since the beginning of the year, 195 of them reported in March only. Since January till 28th of March, nearly 147,927 cases of severe acute watery diarrhea and suspected cholera were reported, according to WHO statistics published last Tuesday. Sana'a and its rural areas came first in terms of cholera death rate, with 58 cases, followed by Ibb (49), Dhamar and Rimah (each with 32), Taiz (28) and Amran (25 cases). On Saturday, local authorities in the Yemeni Houthi-held capital ordered all the city's schools to close cafeterias for ten days,as protective measure to limit outbreak of diseases and epidemics including cholera. Last Thursday, the Houthi group issued a ban on the entry of all vegetables and other crops irrigated with sewage waterinto Sana'a. Yemeni activists have recently circulated footages of dirt water as being pulled out of sewage pipes to water farms in Sana'a outskirts. Houthis critics accuse the rebels of using the epidemics as political card, to gain funds from international groups and to attribute the diseases to war, charges denied by Houthis. Yemen has been racked by bloody conflict between the Saudi-backed government and the Iranian-backed Houthis who have taken over Sana'a and most populated areas in the north since late in 2014, triggering what the UN dub as the world's worst humanitarian crisis.